Columbus day didn't affect us as Steve still went to work and my tot's school wasn't off. But this week felt so short. Even then, I am so glad weekend is here! Steve was out of town for a few days this week and he's back today. These cookies are his all time favorite amongst my baked goods. Also family favorite too. It's the first thing I baked for my nephews when I first met them and ever since then, they always give me the same reaction when they see these. Very sweet. These are not chewy type of cookies. If I feel like making it a little on the chewy side, I use brown sugar instead of regular sugar but I think crusty texture goes nicely with this flavor. Mixing half brown and half regular sugar works too. Cookies don't have to be exact like other type of baked goods, so change up depending on your taste. I've been baking these for a long time and over time, I changed here and there and settled with this ratio. 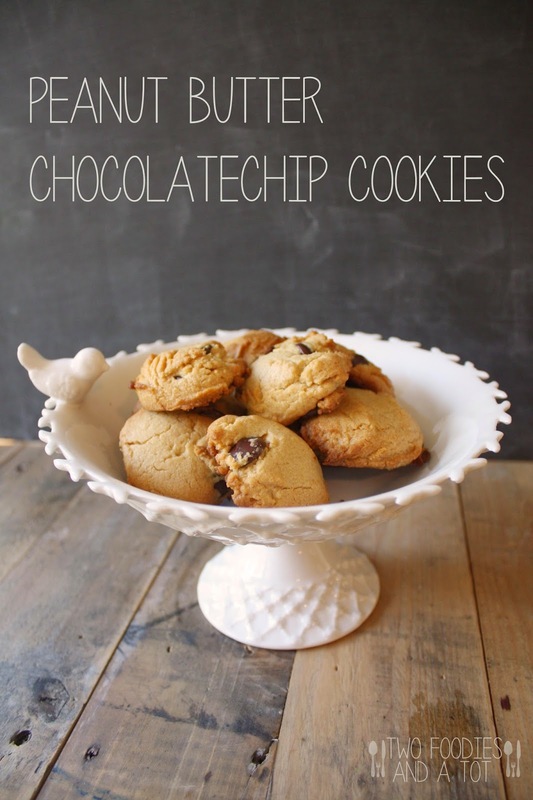 I would recommend regular sized chocolate chips rather than larger ones. I usually use them but this time this was all I had and I don't know if I like it. I mean of course, again, depending on your preference. I find that when I scoop the dough on the pan, big chunk of chocolate chip falls off and it annoyed me. Well, I am a person with a little patience. =P Either way, these are super easy and quick to bake. 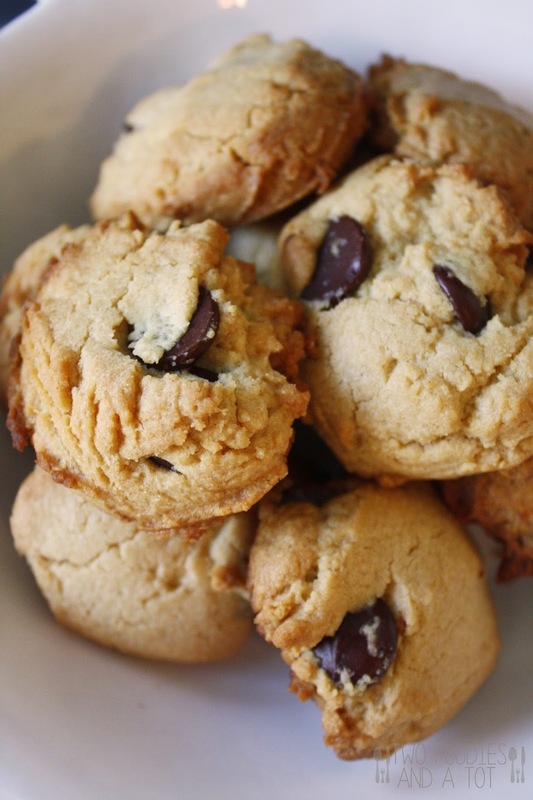 When I crave some freshly baked cookies, this is the go to recipe for me. 1. Preheat the oven to 350F. In a mixing bowl, cream the butter and peanut butter. Add in sugar. When mixed in, add the egg and mix until well incorporated. 2. Add flour and baking soda to the butter mixture. 3. Add chocolate chips and mix gently. 4. 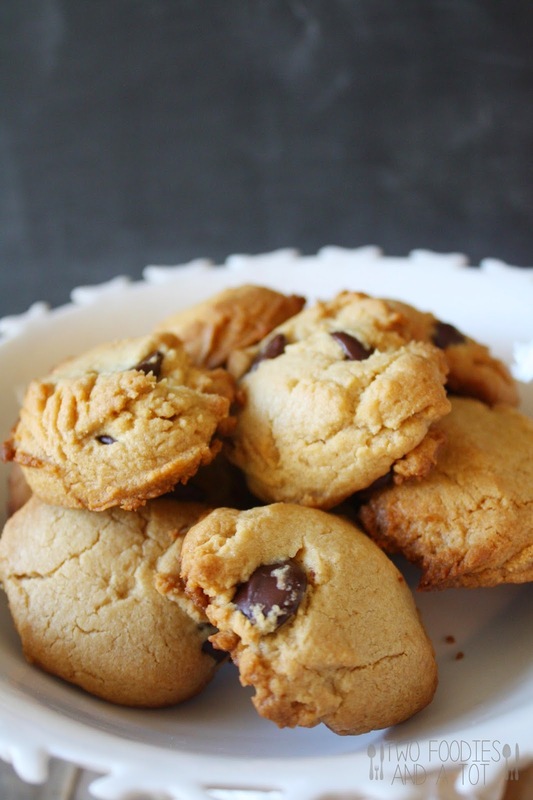 Scoop the cookies on a lined pan and bake for 15-17 minutes, or until golden brown. Cool on the pan for 10 minutes and move them to a cooling rack. And enjoy!